North Morlan Band has played a show nearly every weekend so far this semester. Left to right: Jack Kimber, Jason Macmillan, Ethan Ganouna, and Naveed Farhadi. Photo by Andres O’Beirne. 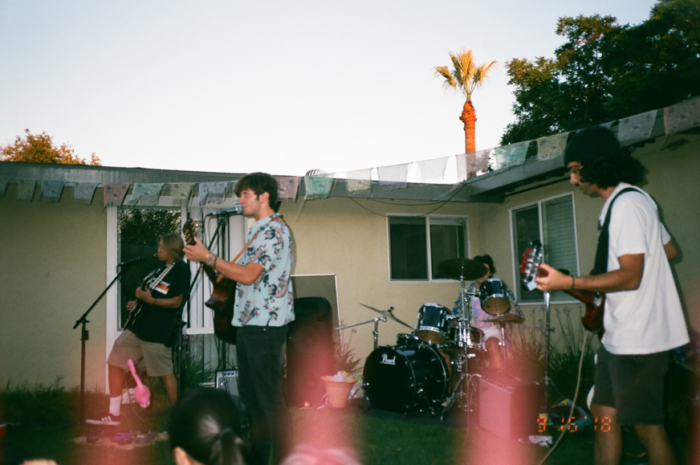 Amidst the drunken frat parties and school organized movie nights, there is an another Friday afternoon alternative for Chapman students: house shows. Students host free live concerts in their backyards and living rooms nearly every weekend. Chapman house concerts are currently dominated by three groups: Freedoms Music, North Morlan Band and Maplewood. Though these artists differ in style and narrative, they all play a part in a do-it-yourself community that relies on self-motivation as much as collaboration. The young artists need performing and recording equipment, places to play, and an audience in order to establish themselves and throw successful shows. Though there are a number of creatives at Chapman, house concerts were not popular at Chapman 10 years ago, according to alumni Tyler Russell, founder of Laguna Beach Radio station KX 93.5. Now shows attract anywhere from 20 to 200 people depending on the space available, the host, event purpose and marketing. The collaboration of artists are what add another dimension to their events. Along with Freedoms Music, North Morlan Band and Maplewood playing shows together, other Chapman musicians as well as cinematographers, photographers and clothing designers have contributed to shows. Known as the duo Maplewood, Charlie Ferris and Kamari Pope are musical partners, as well as best friends since they were in diapers. Freedoms Music, which currently consists of Brooke Harmon, Zachary Salem-Mackall and Matt Owens, has a psychedelic R&B sound that is themed with ambient lights and the color purple. North Morlan has a laid back indie rock vibe that features love songs and guitar solos. North Morlan or NoMo, is made up of Jason Macmillan, Naveed Farhadi, Ethan Ganouna and Jack Kimber. Maplewood is a highly stylized rap duo, Charlie Ferris and Kamari Pope, from New York that is as much an image as it is music. Though these bands dissent from each other in both style and philosophy, they must deal with similar battles that come with being a Chapman band. One of the first matters is obtaining their instruments, technology and equipment. Freedoms Music, who has been a band for three years, and North Morlan Band, who is going on their second year, have all of their own equipment. In fact, sophomore guitar performance major Jason Macmillan says he has invested $7,000 to $8,000 in his personal set up for North Morlan Band. 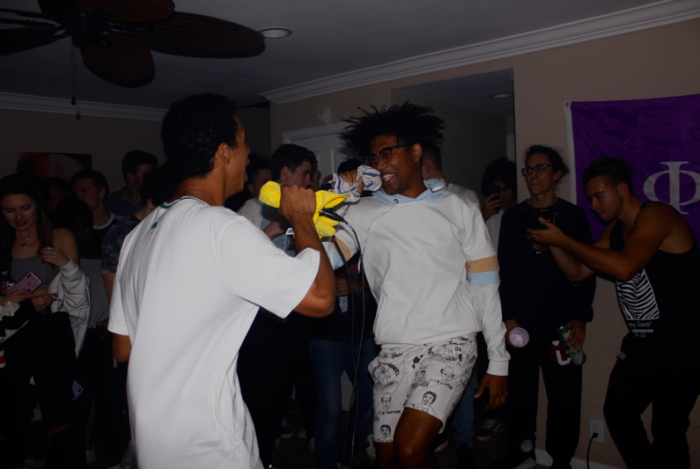 Maplewood, who is newest to the Chapman music scene, lacked microphones and ended up in a sticky situation at an event they had put a lot of time and marketing into. Charlie Ferris, sophomore television writing and production major and Maplewood rapper, was frantically looking for a microphone for over a week before their Oct. 5 show a student’s residence on Tracy Lane. When Ferris tried to rent a microphone through Chapman, like he had initially planned, he ended up frustrated and empty handed. Luckily they were able to borrow a microphone from junior Matt Owens of Freedoms the day of the show. After the show at Tracy Lane, where the video footage was taken, Maplewood was full of energy saying this had been their best show yet. Video by Cameron Thuman. Maplewood also has struggled with trying to use the school’s recording facilities. Ferris and Kamari Pope, also a sophomore television writing and production major, still desire access to the recording studio in Oliphant Hall to make their personal music. “The school’s resources should be accessible for anyone who wants to pursue their interests,” Ferris said. This didn’t stop the group from recording their music. Like Freedoms and North Morlan, Maplewood has been able to independently record their music using applications on the computer. Having recordings on internet streaming platforms like Soundcloud or Spotify helps grow the artist’s audience from local peers to anyone on the web. North Morlan however, explained that while they do not publicize the “rough” recordings they have on Soundcloud, people know the lyrics to their songs just by attending their shows. Jason Macmillan, lead guitarist and singer for North Morlan, recalled that one of his most memorable performances was at their show Oct. 5 at friend’s Tracy Lane show. The event gathered a crowd of about 80 people, according to sophomore film production major Loucas Tsilas, who hosted the show. Circling the band were about 20 fans, or Nomies as the band calls them, shouting the words to every song along with Macmillan. North Morlan played last Spring at the House of the Arts event at Chapman that featured student musicians, artists, and a vintage fashion collection. Video by John Dellano. While the support of the Chapman community has prompted much of these bands’ success, finding a fan base after graduation may be much tougher, says Russell. They have to obtain new connections and resources in order to build a fresh audience outside of the 8,542 students at Chapman. As budding musicians with relatively limited resources, marketing skills and budgets, the bands take on a very do-it-yourself mentality. They market themselves through a combination of word of mouth and social media. The bands all have Instagrams (@freedomsmusic1, @maplewoodmusic, @northmorlanband) and agree that it is the best social media platform to promote their group. Maplewood posts their upcoming shows on their group’s instagram, their personal instagrams and encourage their friends to do the same. Though North Morlan Band and the Freedoms claim to do about an equal amount of verbal promotion as they do online, Maplewood has a huge media marketing approach. Pope and Ferris post events multiple times a day on their personal Instagram stories and Maplewood’s Instagram. They also have friends who promote their events and songs on Soundcloud, and even incorporate them in their shows and promotions. Maplewood intertwines their graphic designer friends such as sophomore Michael Starbuck to make promotions; feature other special guests like sophomore DJ Cadre Carrigan; cross market with sophomore Cameron Daly’s clothing line “Nice As Heck” and involve other media creators through Dodge College. Despite the efforts bands put in for planning, obtaining and moving equipment and building an audience for a show, the night can still get ruined by a noise complaint. The Orange noise ordinance that went into effect in September permits only low noise after 10 p.m. If the show starts too late, the bands risk getting cut off by the police. The bands use large speakers and amplifiers and often perform outside, which shut down the Freedoms Music April 20 house show last spring. The shows now just have to start in the afternoon or early evening to avoid disruption to the neighbors. Even when it’s not the night of a show, the bands must be conscious of their noise levels during practice. North Morlan Band has been visited by the Orange Police four times this semester just for practicing in their garage, according to guitarist and junior business major Naveed Farhadi. The most recent time OPD visited his residence, they warned the band that another visit would warrant a ticket. For this reason, North Morlan must practice before sundown, which can sometimes interfere with their student and extracurricular obligations. Noise complaints aren’t a new experience for North Morlan. Last year, when the band practiced in the dorms, they frequently received texts from neighbors that the band was “shaking the building.” Regardless, the band claims they never got in any real trouble. “It’s the same s— with the noise stuff, but now it’s the cops,” Macmillan said. The members of North Morlan sympathize with their neighbors and try to keep noise levels to a reasonable level. However, the police have been called in the middle of the day whether or not the the band was using the drum kit. One of the times the police came, it was only Naveed Farhadi and Jack Kimber playing guitar in the garage. The cops have been friendly and lenient with the boys. One officer even said he was a musician himself. Nouna also mentioned that their landlord is on the boy’s side. Zach Salem-Mackall plays the electric guitar with The Freedoms at their Oct. 4 performance for an L.A. charity event. Zach Salem-Mackall and Matt Owens of Freedoms don’t have an issue with noise complaints in their Santa Ana home. Their main dilemma is finding time to practice their music with their busy schedules, as well as perfecting their sound. Freedoms Music worked for months to complete their first EP “Tasting Purple” that they released on Soundcloud this summer. The band has also struggled to find a new member, since their drummer of the last two years, Daniel Cole, graduated last semester. Since his departure, they’ve had multiple drummers fill in but would prefer to find a permanent member. Teaching a new drummer all of their songs can be a tedious process, especially for members that end up being transient, says Salem-Mackall. In the meantime, they have found plenty of Chapman musicians to fill in, including sophomore film production major Ethan Ganouna, who is also North Morlan’s drummer. One of Freedoms influencers is the band The Internet, in which they cover their song “Look What You Started.” Video by Billy Benjamin. 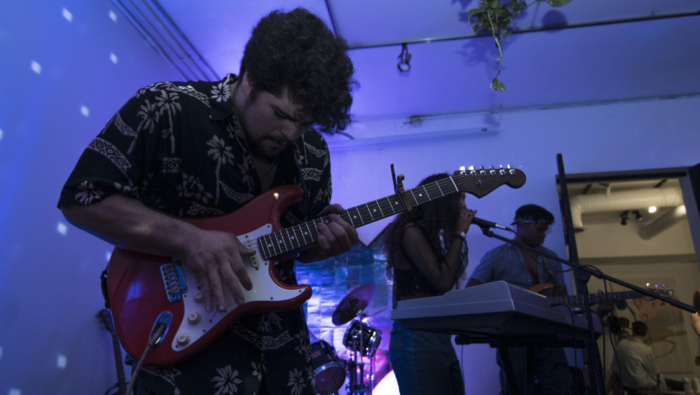 The Chapman music scene has changed significantly after prominent student musicians graduated last year, says Salem-Mackall, junior communications major. The New Hippies, Ginger Root, Philip Stilwell, Brucey Boi and Buddha Trixie all played at house shows last year. Since graduation, all of these groups have continued making music beyond college house shows. Ginger Root, Cameron Lew’s solo project, has hundreds of thousands of listens on Spotify and has toured across the country multiple times. Lew is currently touring through Europe alongside the band Khruangbin. Performing taught Lew to adapt to different technological set ups and how to perform for different audiences. Sometimes at house shows, Ginger Root would only have twenty minutes to perform and had to set up quickly and with less equipment. He also learned to play livelier songs to engage the audience. All three bands have plans to perform outside the Chapman community within the next month. 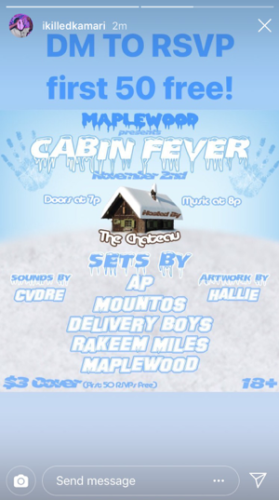 Maplewood is holding an event called Cabin Fever with four other hip-hop and rap groups Nov. 2. North Morlan is opening for The Mowgli’s Nov. 11 at The Observatory in Santa Ana, and Freedom’s Music is arranging a show at The Mint in Los Angeles.